On Saturday 18 June 2011 Dayne Zorko ran out onto a brand new $9million stadium at Mandurah, about an hour south of Perth, with his AFL dream hanging by a thread. Set for Queensland’s interstate clash with Western Australia, he was a 22-year-old who had established himself as one of the very best players in the domestic competition but had been overlooked by AFL recruiting scouts four years in a row in 2007-08-09-10. Although nobody was saying it at the time, this was realistically Zorko’s last chance. He wasn’t the main attraction for recruiters, but at least he had their attention at a level where a quality performance would carry genuine weight. About three hours later he walked off the ground with a Zane Taylor Medal around his neck and his AFL dream very much alive. Zorko was a clear standout for Queensland in a heart-stopping six-point loss to the division one heavyweights which might have gone the other way if it had gone a couple of minutes longer. He had 30 possessions, eight tackles and kicked four goals, including three in the final quarter to give the Maroons a sniff of victory. His fourth goal at the 32-minute mark of the final quarter was a 65m boomer that bounced through but before play could be re-started the final siren went. WA had hung on. Just. Queensland coach Jason Cotter said he was “absolutely” convinced on that day that Zorko could play at AFL level. But, more importantly, so was Brisbane Lions list manager Rob Kerr. Having gone to Perth specifically to watch Lions rookies Niall McKeever and Joel Tippett play against a star-studded WA side, Kerr left convinced that Zorko was their man. But there was one final sticking point. Zorko, a born-and-bred Gold Coaster, was zoned to the Suns under the expansion club’s recruiting concessions. So, Kerr initiated a complicated trade that would effectively see the Broadbeach captain and 2008-09-10-11 B&F winner join the Lions in exchange for selection #34 in the 2011 AFL National Draft. It was a defining moment in the life of the one-time bricklayer, whose father had moved from Yugoslavia to Melbourne before settling on the Gold Coast. Zorko, who attended Benowa State High School and played his junior football at Surfers Paradise, had captained the 2007 Queensland U18 side coached by Danny Craven. Teammates Brendan Whitecross, Sam Reid and Jake Spencer, who are still playing in the AFL with Hawthorn, GWS and Melbourne respectively, were drafted in 2007 with Joey Daye, Rhys Magin, James Mulligan and Adam Spackman. But Zorko missed out. Initially, popular opinion was that at 175cm he was simply too small. That despite being just 2cm shorter and 2kg heavier than North Melbourne’s AFL games record-holder Brent Harvey. But as time wore on the football world judged the pocket-sized dynamo more harshly, suggesting that perhaps it wasn’t just his lack of size. Matt Angus, who took over as Broadbeach coach in 2011 after Zorko had resisted a string of interstate offers to give his homegrown AFL dream one last chance, told his skipper and best player the harsh truth that perhaps he needed to hear. According to local media, Angus told Zorko he had the skills to play in the AFL, but described his professionalism as “nowhere near that”. Whatever, the combination of some tough love from Angus, a lot of hard work from Zorko, that standout performance for Queensland against WA and a little Lions recruiting courage combined to write one of Queensland football’s great success stories. After some early injury problems in his first year at the Lions Zorko debuted in a 58-point loss to Collingwood at the Gabba in Round 7 2012. Steele Sidebottom, Dane Swan and Scott Pendlebury each had 30-plus possessions for the Pies to collect the Brownlow Medal votes as the home team’s first-gamer spent more time on the interchange bench than he did on the field, collecting a mediocre eight possessions and two tackles. At 23 years 93 days Zorko was old by first-game standards. In fact, among 165 Queenslanders to have played at AFL level only 12 have been older on debut, headed by ex-Mayne champion Tony Beckett, who was 26 years 304 days on debut for the Brisbane Bears in 1987. But having waited so long for the chance to show his wares alongside the very best Zorko wasn’t about to waste it. He had 18 possessions, six tackles and kicked his first goal against GWS at the Gabba the following week. And a further three weeks later, in his fifth game against eventual grand finalists Hawthorn at the MCG, he had 24 possessions, seven tackles and three goals. Rob Kerr was right. The young man they called ‘Tinker’ could play. Really play. 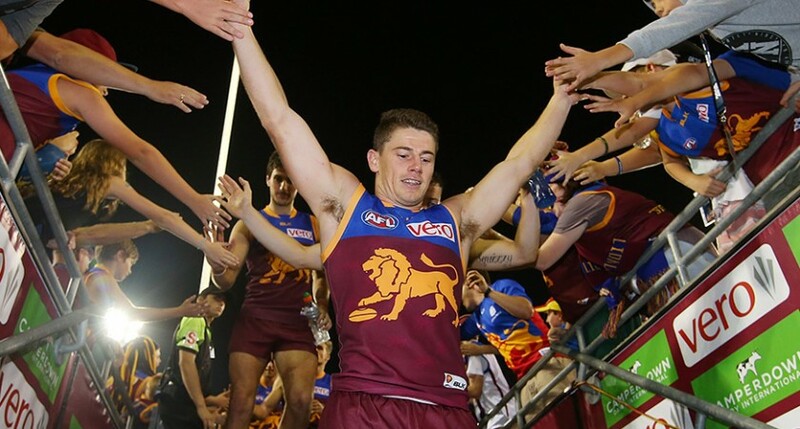 Since his belated opportunity at the highest level Zorko has excelled on and off the field. Having begun his AFL career with 59 consecutive games, he’s missed only three games since his debut – two for personal reasons and one due to suspension. Never has he been unfit since his debut. He’s polled consistently well in the Merrett/Murray Medal, finishing equal 7th in 2012, despite missing the first six games of the season, equal 4th in 2013 and runner-up in 2014 before sharing the Lions’No.1 individual award with Dayne Beams, Stefan Martin and Mitch Robinson last year. So well has he played this year that he’s an unbackable favourite to go back-to-back and join Michael Voss (5), Simon Black (3), Jonathan Brown (3), Michael McLean (2), John Gastev (2), Jason Akermanis (2), Joel Patful (2) and Rockliff (2) as multiple B&F winners in the 30-year history of the Brisbane Football Club. He’s kicked 100 goals in his 99 games, and averaged 20.6 possessions, with 11 games of 30 possessions or more. He kicked a career-best four goals against Collingwood at the Gabba in Round 8 this year, and has twice had 38 possessions in a game – against Fremantle at the Gabba in 2014 and Adelaide at the Adelaide Oval in 2015. He’s received 22 Brownlow Medal votes in 2012-15 – less than only Rockliff (48) and Pearce Hanley (24) in the Lions camp. He’s also served the code in excellent fashion as a Queensland NAB AFL ambassador for three years and more recently has taken on a role as a Multicultural Ambassador. On Sunday the now 27-year-old midfielder/forward will play his 100th AFL game against Geelong at the Gabba. He’ll be the 43rd Queenslander to reach triple figures, and only the fourth to reach this mark after debuting beyond his 23rd birthday, following in the footsteps of Warren Jones, Ben Hudson and most recently Lee Spurr. He goes into his milestone game in excellent form, having had 27 possessions, 12 inside 50s, a career-best four goal assists and three goals against Carlton last weekend to earn selection in the AFL Team of the Week. And for the trivia buffs, Zorko is one of just 21 players whose surname starts with the letter “Z” to have played VFL/AFL football, and will be the 7th “Z” to play 100 games.